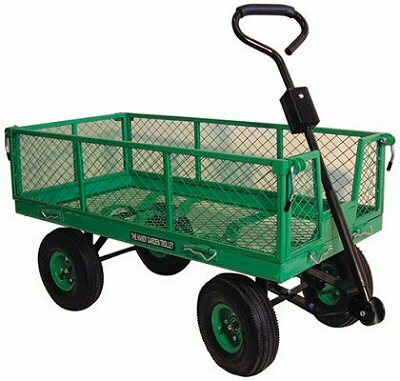 Our Garden Carts carry much more volume than traditional wheelbarrows, yet put much less strain on your back! Similar in construction and build quality to our Large 350Kg Max Load Garden Cart, this Garden Cart is ideal for the medium-sized garden. Two-piece handle for hand or tractor/mower towing. All steel construction, four hinged drop sides, turntable steering, pneumatic wheels (25cm dia) with bearings, 200kg load capacity. Overall dimensions 109cm long x 50cm wide x 60cm high (excluding drawbar handle). Internal dimensions 94cm x 48cm x 25cm deep. Ideal for all ages, our garden carts are strong, but lightweight, and are designed to save you a lot of wasted effort in your garden. How many times have you tried to use you wheelbarrow for transporting leaves or grass clippings, only to find that your barrow starts to overflow very quickly - you end up creating a large pile and lay your rake over the top to hold it in place, but still manage to drop half of it across your lawn on your way over to the compost heap! Our garden carts have a large carrying volume and are light-weight too. With four pneumatic tyres you will not need to lift your load (as you do with a barrow), you just pull it. Also, the smooth action rack steering means your cart won't tip over under heavy loads, even when you are turning corners. Our carts are fitted with a comfortable two-hand grip pull handle and are constructed using heavy-gauge steel. They are ideal for shifting pots and planters, hauling logs, paving slabs and soil, or simply for carrying around garden tools and equipment. All our garden carts have drop-down sides for carring oversized loads. Four-wheeled trollies are not a new idea, but these very affordable versions for domestic garden use, and really do save you a lot of effort - we are very happy to recommend them!